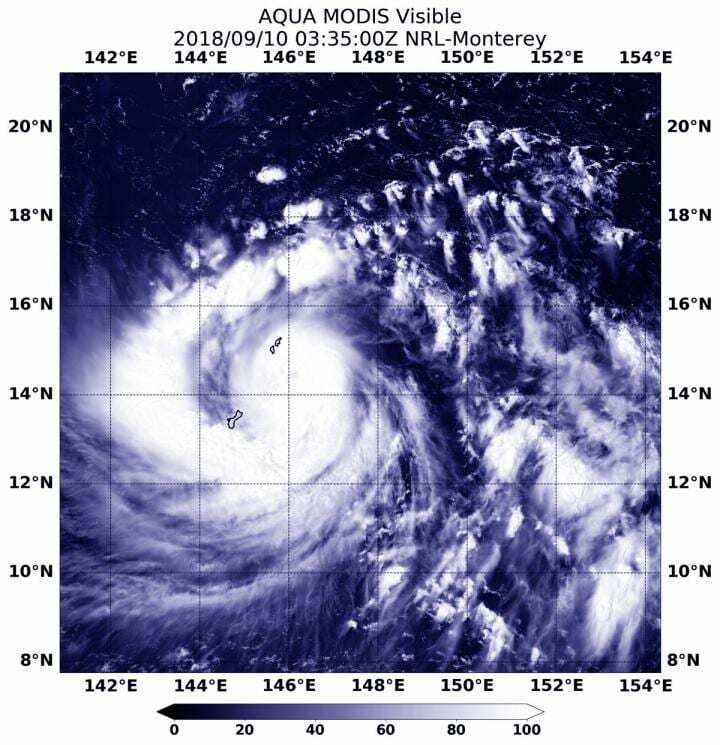 NASA's Aqua satellite passed over the Northwestern Pacific Ocean and captured a visible image of Typhoon Mangkhut lashing Guam and the Northern Marianas Islands. At 0335 UTC on Sept.10 (11:35 p.m. EDT on Sept. 9) the Moderate Resolution Imaging Spectroradiometer or MODIS instrument aboard NASA's Aqua satellite provided a visible image of Typhoon Mangkhut. Satellite imagery shows the center over the Northern Mariana Islands and a thick band of thunderstorms wrapping from south of the center to the west past Guam. At 5 a.m. EDT on Sept. 10 (7 p.m. CHST local time), the NWS in Guam noted that "Damaging or destructive winds are now occurring. Damaging south winds of up to 105 mph with gusts to 120 mph will continue for the next few hours. Winds will gradually decrease to between 55 and 65 mph around midnight. Damaging south winds early Tuesday morning will decrease to 25 to 35 mph by the afternoon. Small craft should remain in port and well secured." At 11 a.m. EDT (1 a.m. CHST/1500 UTC) the center of Typhoon Mangkhut was located near Latitude 14.1 degrees north and longitude 143.5 degrees east. That's about 95 miles west-northwest of Guam, 115 miles west of Rota, 155 miles west-southwest of Tinian and about 165 miles west-southwest of Saipan.